It’s the penultimate issue of Suicide Squad Black Files, so both of the stories in the issue are building to their conclusions. It’s worth noting that, in both cases, the main group of the Squad are now fully engaged in the events taking place. As always, I prefer the Suicide Squad Black story. That’s pretty much a given, considering that Katana has never been my favourite character, and I am a sucker for magical stuff, and love the Gentleman Ghost. But even given that, I have found myself enjoying Katana’s body switching battles against Kobra far more than I expected I would. It looks like Halo will be the game changer. In this one, she meets the rest of the Suicide Squad, and is the one to explain to them that Katana and Lady Eve have switched minds (or bodies, whichever way you want to look at it). I suspect she will also be given a significant role in the climax of the tale. If so, I will be very happy. This story arc has served as a wonderful reboot for the character. 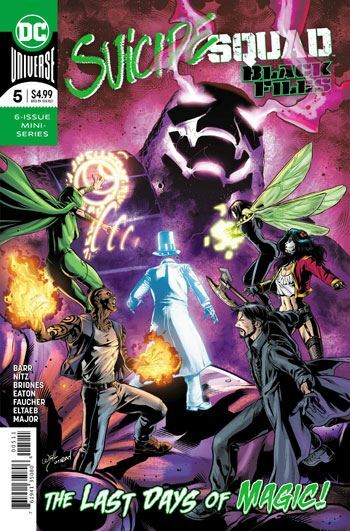 In the Suicide Squad Black story, Amanda Waller is having a hard time keeping things under control as Sebastien Faust has lured away part of her crew, and his plans are coming to fruition. The Enchantress and Croc are re-united, which at least puts this into some context of time, taking place after the witch’s apparent death. Given all the fighting and scheming, this chapter manages to have more of an upbeat note. For a while, at least, until things all fall apart. I’ve said it before, but I would gladly read a regular Suicide Squad Black book, and really hope we get to see this offshoot team again.